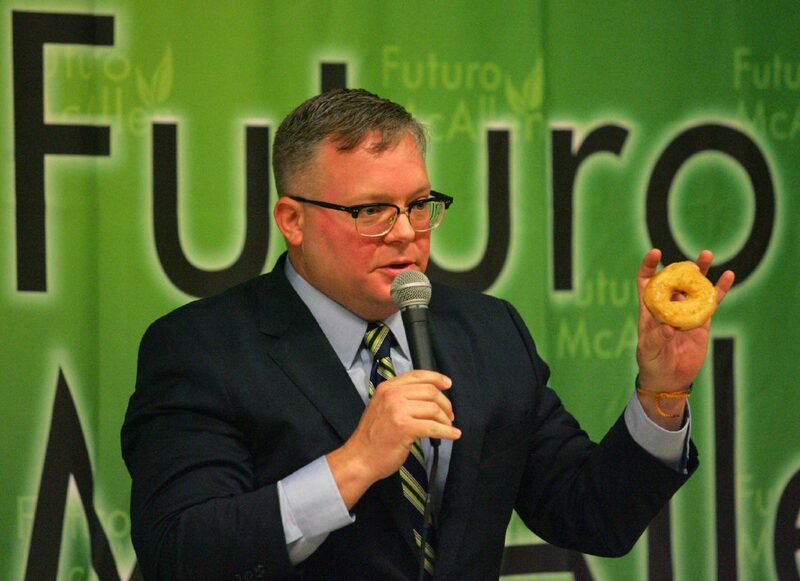 McAllen City Commission candidates for District 1 Tim Wilkins compares McAllen's growth to the shape of a donought during Futuro McAllen's debate for the candidates Thursday, January 11, 2018, at the McAllen Public Library. 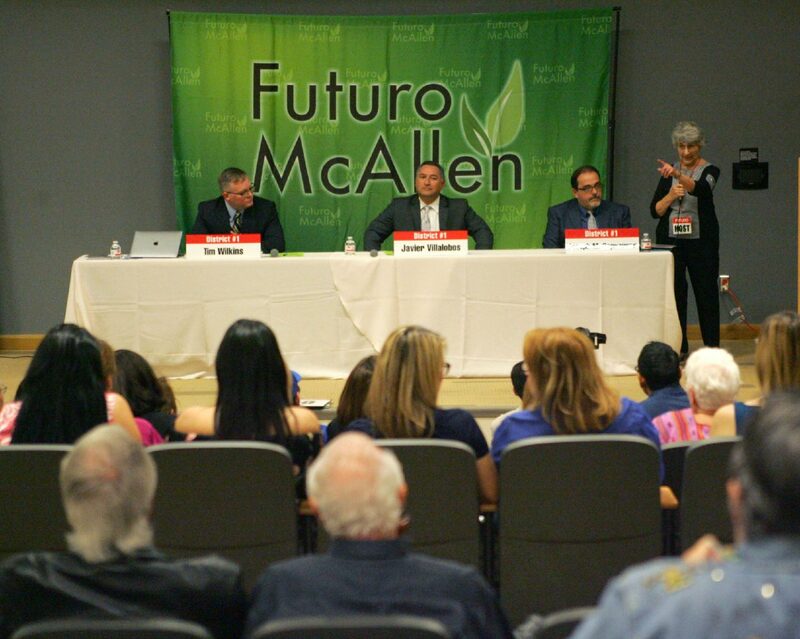 McALLEN — Outside of declining sales tax revenues, drainage issues, traffic at the ports of entry, and representation in state and federal government were among the topics candidates discussed at the District 1 forum Thursday. The candidates — Joseph M. Caporusso, a podiatrist; Javier Villalobos, an attorney; and Timothy Wilkins, owner of Sofie’s ‘SS’ Saloon and CEO of CADTax Property Tax Consulting — answered questions from a three-person panel comprised of Monitor reporter Mitchell Ferman, radio host Davis Rankin from KURV and Monica Stewart of Futuro McAllen, which hosted the forum. Caporusso, Villalobos and Wilkins are vying for the remainder of the term of now-former Commissioner Richard Cortez, whose post was vacated upon his entering the county judge’s race. However, it was the candidates’ experience and qualifications that book-ended the forum. McAllen City Commission candidates for District 1 Tim Wilkins, left, Javier Villalobos and Joseph M. Caporusso are introduced by Nedra Kinerk at the beginning of Futuro McAllen's debate for the candidates Thursday, January 11, 2018, at the McAllen Public Library. 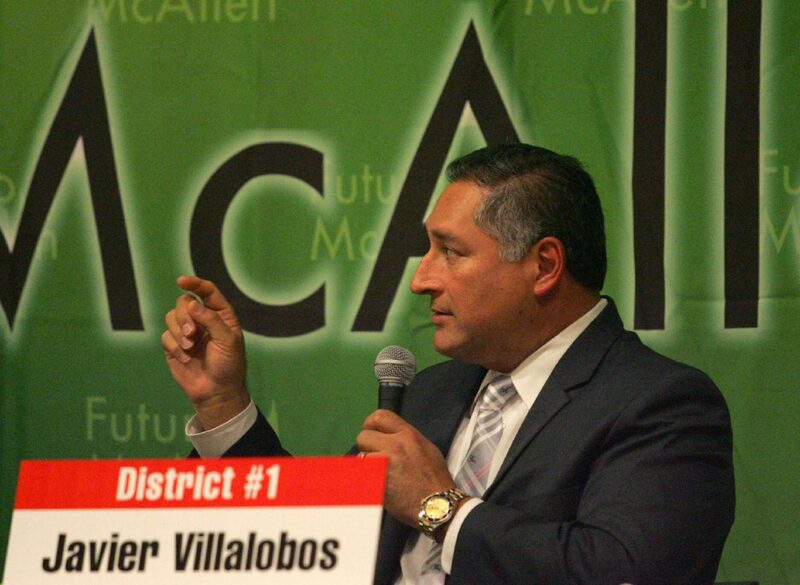 McAllen City Commission candidates for District 1 Javier Villalobos answers a question during Futuro McAllen's debate for the candidates Thursday, January 11, 2018, at the McAllen Public Library. 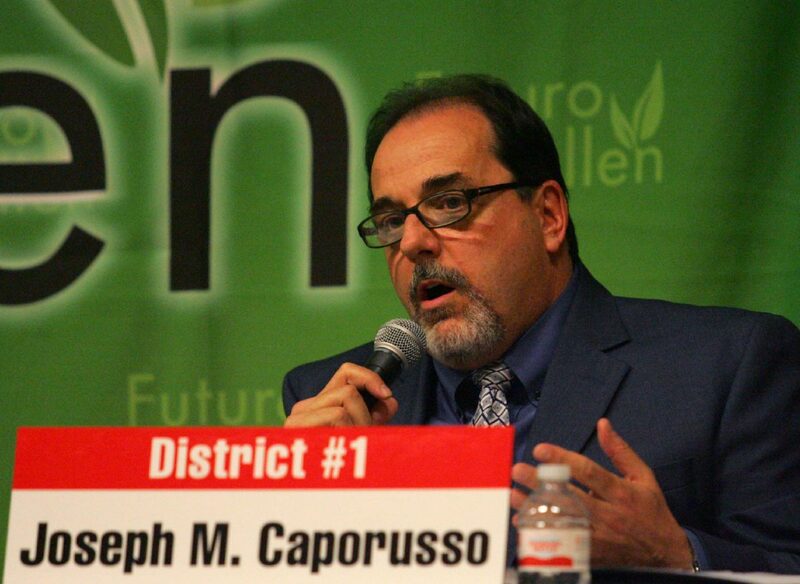 McAllen City Commission candidates for District 1 Joseph M Caporusso answers a question during Futuro McAllen's debate for the candidates Thursday, January 11, 2018, at the McAllen Public Library. Villalobos emphasized his experience working in “the municipal arena,” as well as working in housing and economic development. “I know some of the pitfalls in municipalities; I know budgets; I know what I can do for the city,” he said. Caporusso spoke of providing a new perspective and touted his background serving on several boards. 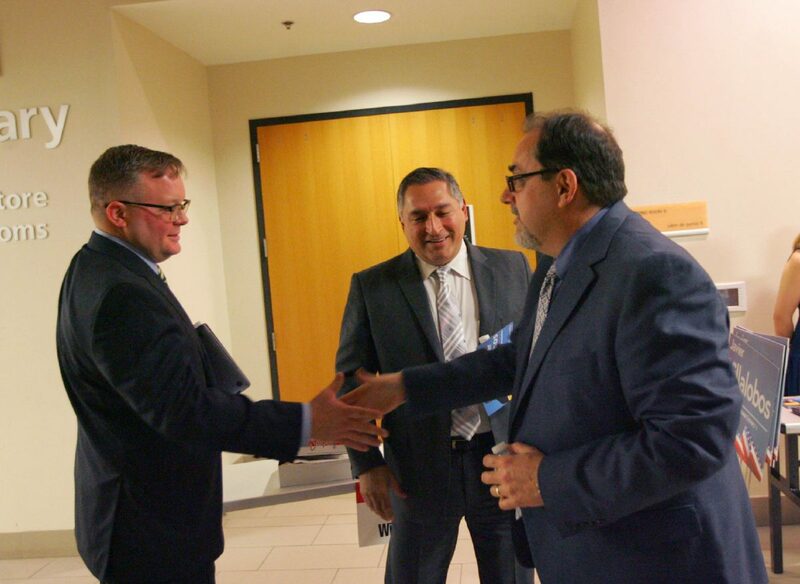 “I have leadership experience where it counts,” Caporusso said during opening statements, and later cited his experience on the McAllen school board, the convention center advisory board and Friends of Quinta Mazatlán, among others. Wilkins, for his part, said he would bring a small business mindset to the city commission. He also did not shy away from criticizing his opponents, framing Villalobos’ role with the city of Donna, where he now serves as city attorney, and Caporusso’s stake in Doctors Hospital at Renaissance as potential conflicts of interest. Both, however, denied their interests in those entities would compromise their responsibilities to the city. Villalobos said he wasn’t afraid to stand up against issues he disagreed with, referencing his opposition to the hospital district in the past. “I will be vocal in the commission if I see something that isn’t right,” he said. To close, Wilkins — like he did during the first forum in December — compared the city to the center of a doughnut, stating that the outside of McAllen is being developed. The city needs someone with small business experience, he argued, to help spur that development.